Sorry for the radio silence since Christmas Eve. I wish I could say it was due to the busy holiday season, but alas, I finally caught the cold Patrick got earlier in the month, and we’ve spent every day since Christmas Eve bundled up and drinking gallons of tea, until yesterday. No, I’m not over my cold yet, nor is he, but ages ago he made secret Fantasmic dinner reservations, as the show will be disappearing for the next year, because its staging area will be disrupted by the building of the new Star Wars themed land coming to Disneyland. So I’ve included quite a few snaps from the show too here, so prepare for a picture heavy post! Fantasmic is my favorite thing at Disneyland, and I wasn’t going to let a little cold stand between me and a dinner at Blue Bayou followed by prime Fantasmic viewing. So, loaded up with cold meds I got dressed in one of my few Disneybound outfits (wearing street clothes that are inspired by Disney characters. You can read more here) and we made our way to the park. I bounded as Maleficent, as she is one of my favorite villains, and a centerpiece to Fantasmic. So, what is Fantasmic and what do I mean by “Fantasmic dinner reservations”? To those unfamiliar with Fantasmic, I hope the above images help out. The show takes Guests into Mickey’s imagination and Guests witness a beautiful spectacle featuring live characters, projections and, my favorite part, Maleficent turning into a fire breathing dragon. As for the dining aspect, this year Disneyland introduced the Fastpass ticketing to the show. It’s similar to what is used for World of Color at Disney’s California Adventure, for those who may have participated in that. Prior to this, Fantasmic was strictly first-come-first-served seating, and those wishing to view from prime locations sat for hours before the show. Seriously, I’m not kidding. Plopping down at 5:30 or 6:00 for a show that didn’t start until 9:00. Yeah, and I was one of them. I did it a ton before the ticketing system was introduced. Now, to sit in the same area as we did before, Guests must purchase a dining package from either the Blue Bayou or the River Belle Terrace. Other seating areas, around the sides, are reserved for regular Fastpass Guests, who must plan ahead and visit the distribution location, located behind Big Thunder Mountain Railroad, to get a ticket. And they do run out! To learn more about Fantasmic, and their dining system, click here. But know, Fantasmic will be closing up shop during the construction of the new Star Wars themed land. You can be certain I am paying for our outing last night, I’ve already taken cold meds, drank two cups of tea, and had a smoothie. I really need to focus on getting better because my dad arrives this weekend! He’s staying in town for about a week, so I need to be better so I can spend time with him. So, I’m doubtful of any New Years celebrations. LOVE the Disneybound outfit!!! Perfect as usual! 🙂 Feel better soon! What a powerfully cool ensemble! From the horns to the flame bedecked bag, this is downright awesome!!! Wishing you and Patrick both a fantastic, fun filled New Year’s celebration! What a fantastic Maleficent Disney bound outfit. 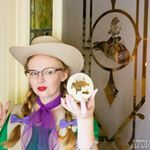 JennyRaeTV over on youtube does a ton of Disney bound outfits. She recently did one for Buddy the Elf and Jovie, it was so cute. Your making me re-think about wearing my little faux leather jacket. It is cut very much like yours but it is not vintage its a Boston Red Sox Legends jacket I bought from the Alyssa Milano Touch women’s sports fan clothing line. Thanks to you now I know how to style the jacket better. You totally nailed Maleficent!! And I’m drooling over your Lux de Ville. I received one last year for my birthday, they are fantastic!